For me, nothing better than my favourite details around the house, a nice blanket on the couch and warm scented candles burning away while I read, or work, or cook… I just love it! Since it’s a bit hard to keep candles burning all the time – nor you want all the wax and chemicals (like paraffin) to be polluting the air you’re breathing – I love to use other methods to keep my home smelling oh-so-nice. Reed diffusers are a good choice, as well as sprays with your favourite scents. 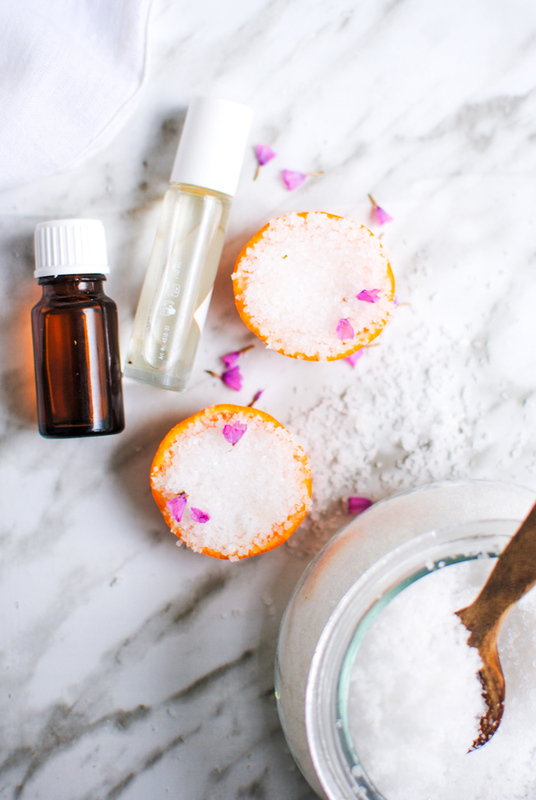 Today I want to share a new method so easy to make at home with everyday ingredients that will not only cleanse the air, but also eliminate bad odors and release the scent of whichever oils, spices or herbs you decide to add in. This is a great DIY and a really nice gift to offer your girl friends, mom or aunties – they’ll all love it and will ask for more, I’m sure. These home diffusers will last a couple months, and even more if you add in more essential oil to it every month or so. You basically need a lemon / orange / lime / mandarin / grapefruit / whichever-citrous-you-prefer and sea salt. No crazy-named salts you’ll take ages to find at shops, just the usual thing. There’s really no excuse why you shouldn’t make them. Half each fruit and scoop out the interior. If you need, use scissors to help cutting the membrane dividing the wedges. If using spices and herbs, crush / chop them and mix with some salt. Place the salt inside the halved citrous, tapping to create more space and add in more salt. In case you’re using, add the essential oil to the salt – 5 or 6 drops will do. Tangerine diffuser with jasmine and bergamote essential oils – my absolute favourite, smells like spring! Place your new scented diffusers in strategic spots in your bathroom, entrance, kitchen… You choose. What are your favourite scents and home diffusers? Show me your creations by tagging them on instagram with #pleaseconsiderliving.